I took it for granted. Alone in my new apartment, there I was staring at the ceiling. You have no idea how boring it was not having internet! I tried real hard trying to do without it. My plan was that I'd be able to concentrate on more important things rather than wasting time online. Sad to say, I AM the king of procrastination, and it looked like it was easier just to do nothing and be bored. I thought checking the internet at known open wifi points would be enough. I waited patiently in three degree evenings for my FB and email to download. Most times I hadn't missed a thing, but the lack of it was akin to not having a mobile phone. You know just in case someone MIGHT call you, when in actual fact they hardly do. It might sound strange but this is the first time in all these years of living here that I actually have my own internet connection. I was fortunate enough to have an open wifi in my first apartment, and after that my other half took care of the later net setup. What also helped pushed to get a connection was that I somehow managed to kill one of my Mac laptops (on my birthday no less), and I had been thinking to upgrade the one I had been using since I got here. Combined with an internet connection you can save a LOT of money on a new computer. I thought that you needed a phone landline in order to get connected. Actually you don't! The cheapest option is the hikari fiber optic mansion (generally highrise apartment, not a rich person's house) connection. There are 2 companies involved - the phone company (NTT Flets), and your chosen ISP provider (eg. Yahoo, OCN, AsahiNet). If you go to the big electronic stores BIC, Yodobashi or Sofmap you will find each have their perks for signing up with them, so it's worth going around to find the best deal. They can also do a building check to see if fiber's available. I signed up on the 5th of January. Along with the discounted Mac, I got 3 months free internet. They coerced me into taking an optional wireless router and helpline support that I won't use, but they tell me I can cancel that without penalty in 2 or 3 months. First payment will just be the 2,100 (+840 yen admin) NTT connection charge. They sent a LOT of papers but the setup was quite painless. I just had to go to Network settings on my Mac - create a PPPoE connection by adding the ISP service name, account name and password to get up and running. I knew my self-imposed ban on buying another guitar couldn't last. It caught my eye near the door of the music shop on December 18th. It was just the body, but from that first glance I knew exactly what it was. The way they do this special finish I mentioned in this post. I immediately asked to put it on hold. He was reluctant but after I offered a deposit he agreed. I knew if I passed it up I'd never see it again. It took a while to actually get it, a whole month! But now it's mine all mine. I woke up early today at about 8am. I wanted to go out. Technically it's the last day of the holiday break, (although I am fortunate enough to have Thursday as my normal day off giving me an extra day). I was out of bed, had breakfast and showered. I was outta there by 930am. She.. took a while. We would not get to Yokohama until about 1pm. We had a double plan, no actually a triple plan, but only managed two of them because of the late start. First mission was the Cup Noodle Museum in Minato Mirai. It took a while of walking around but we found it. As part of the 500 yen ticket you get to make your own noodles, but seeing as we were late, the spots were filled so I'll have to tell you about that in another attempt in the future. Another BIG reason to come here was to go to Art Rink. I mentioned it before, but last time we didn't didn't actually do it. It's been over 20 years since I last put on a pair of skates. I can remember Peter Gabriel's "Sledgehammer" was playing over the loud PA. Also I can recall how lousy I was. True to form I was not a gazelle from "Swan Lake". As much as I wanted to move with such grace, it took a LONG time for me to even get my center of gravity in balance. What probably made it harder was being one of the few gaijin on the ice, I felt any fall would have been noticed and ridiculed by watching Japanese ready with cameras to capture my folly. Also too, I had my camera with me that I was quite terrified of breaking had I fallen over. Luckily I managed not to fall at all. After three hours of perseverance, I maintained an acceptable level of balance, but even as we left my only way of stopping was banging against a wall. It was getting cold so I had to admit a little bit of defeat. I had fun though! I'm sure to come again. Maybe this will be like Zushi was for me in Summer. Quite cheap too. Only 500 yen to get on the ice, and another 500 yen for skate hire. Being outdoors, it's only open until February. While we were in Yokohama we took advantage of a free butter chicken curry from Muji. There IS a catch though. To claim your prize you have to play their Sugoroku game. It asks for a twitter, Facebook or Mixi registration, but it's otherwise straightforward if a little frustrating to play. It took me over 240 tries to claim my prize, so have nerves of steel and you will be rewarded. Be quick. This freebie is only till the 10th. Ok, so until next time. Bub bye! We've been to Mt Takao numerous times before, but it's strange I never really noticed the Trick Art Museum, a VERY short walk directly across the road from Takaosanguchi station (Keio line). Haven't done much this New Year's break so a good reason to get out of the house. The museum has predominantly an Egyptian theme. 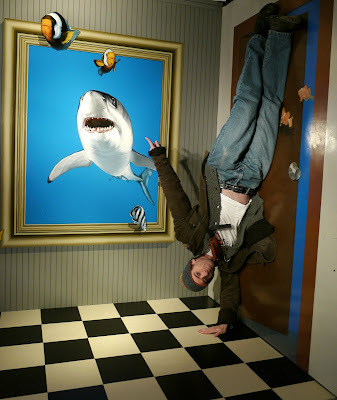 I love optical illusions, so it's definately in the highest part of my top five museum exhibits. They encourage hands on, so it was quite a bit of fun to pose directly incorporating yourself as part of the art. They allow photographs. Actually you HAVE to bring your camera to get the full effect. Somehow seeing it directly takes a bit more to fool your mind, but in a photo it looks pretty amazing. If you've ever been to the Leaning Tower in Pisa and taken a photo "holding it up", this is the place for you! The only real negative is that the place is quite popular and now that it's holiday time, it was FULL of kids, so taking that photo was sometimes frustrating and ruined a good illusion. Go when it's as least busy as possible. A discount ticket can be printed off from the website. You'll get a free drink token for the vending machine outside the entry on your way out. We wasted a lot of time in the museum so we didn't have as much time as we liked to go up Mt Takao. We usually hike up. Ironically being winter it would've been the easiest time to walk up, but as time was cutting it fine, we took the chair lift. This is a first for me. I thought there was only the cable car. Chair lifts are MUCH more fun. Brings out the kid in me. We only had less than an hour so it was almost time to go down not long after we got to the top. I managed to take a photo of Tokyo in the distance. Now it's finished it's quite easy to identify the Tokyo Sky Tree as part of the skyline. If you want to do both the museum and Mt Takao it's a good idea to leave as early as you can. Both highly recommended!